Beto the Bernie of the Border, Bags it! There is at least one occurrence of a Six card in your reading in a prominent position (Long Range, Pluto, Result, Environment or Displacement). This might be in either your Birth Card Spread, or your Planetary Ruling Card spread. Either way, this gives you a special opportunity, but one that is only taken advantage of by those who are aware of it. Sixes give us an opportunity to discover what our true purpose is for our life. Most people search their entire life to discover what their life is about and whether or not they have some special purpose or goal that they are to achieve during their time here on the planet. Many never find this purpose at all. Because of the presence of a Six card in a powerful position this year, you will have a special opportunity to discover what your purpose is. Of course, this only applies to you if you have the desire to know. If you are not that interested in knowing more about your life's direction, this will probably manifest itself as a year of steady progress towards existing goals. Sixes can be frustrating as well because they often represent static and unchanging conditions in our life. However, they also bestow upon us a special ability to perceive that which is usually hidden from our conscious minds. By listening to our inner voice, we can receive great inspiration and direction when these cards are present and you have at least one of them for this entire year. If you have more than one Six in a prominent position in either your Birth Card or Planetary Ruling Card Spreads, then this message becomes even more significant. Study any and all Sixes that you find in these prominent positions this year, along with other Sixes that appear in your Yearly Spreads. They will reveal much about the special destiny that is coming your way. Good luck on your path to inner discovery. The Cards that influence your entire year. The cards in this part of the report are from your Birth Card's yearly spread. These are the most important influences of the year so pay close attention to them. 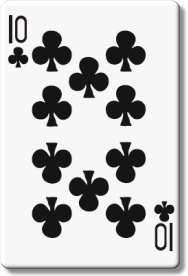 There will usually be a second part using cards from another of your personal significators. But the Birth Card part is the most significant. The King of Hearts rules through love. He has all the power and knowledge of love and knows how to use it. This powerful card bestows you with his power and you can apply this to your personal and professional life this year to great success. This card is an indicator of success in the arts, or in any business that deals with the public. Just remember not to abuse this power. Rule with love and everything will turn out in your favor. 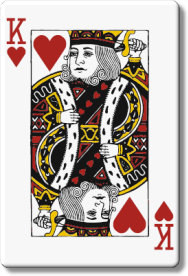 As someone with whom you may have an important involvement with this year, the King of Hearts is usually an older man, kind-hearted and good tempered, who has considerable charm and emotional persuasiveness. 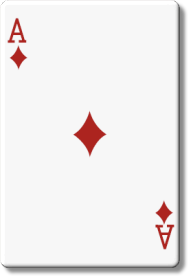 The King of Hearts is a sign of strong feelings and power to influence others that can either help you achieve your goals or get you into trouble. For women, the King of Hearts can mean having the lover or man of your dreams this year. It can be a sign of marriage as well. For men, the King of Hearts can indicate their role as a father and that this will be an important aspect of their life this year. I have mastery over my emotions. I have mastery in all my relationships this year. This will be a year when you make some major changes in the way you relate to money and finances. You may have just had a change in your values or your philosophy about money that leaves you clear that you definitely want to obtain more prosperity and abundance. A strong impetus is present which will most likely motivate you into action to create more prosperity in your life. It is likely that you will make entirely new plans for creating more wealth, perhaps launching a new business or financial enterprise. To achieve your new financial goals you will have to make many changes in the way you do things and this will not always be easy. This year could very well be the dawning of material success as one of your new enterprises could prove to be quite lucrative in a long term sense. Look at the Result Card for more specifics about this new desire for prosperity and how you mean to achieve it. My strong desires for financial prosperity transform me and my actions. I create new beginnings for me, my work and life. I accomplish much success as a teacher or communicator. I harness my mind for recognition from the public.